2. Review by Mike Sanders Mobile, June 2 1975 4:30 pm. Madison, the last bootleg label standing proud, deliveries the goods again. 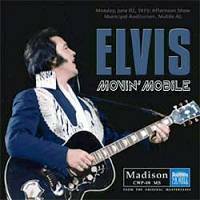 Moving Mobile comes with the traditional eye candy design that become the trademark of the label, with a great cover and rare pictures coupled with informative liner notes. The show is a typical June 1975 show, which by no means is bad. As we are familiar, in this period Elvis seemed to be extremely happy and enjoying being on stage. The song list is well balanced and the songs are equally well treated. Elvis voice is a little shack in some of those shows, but this is not distracting and Elvis good humor makes up for it. His health conditions were still plaguing him, but as the months went by he was getting better and better. It all started good in Vegas in March, but in April and May he was again feeling unwell. By June he had stabilized himself again, and in July, his voice would be fully recovered again, culminating with a strong season in Vegas in December. The tape, as is common to almost all June 75 shows is incomplete, beginning at the end of the 'Amen' segment. All in all, this afternoon in Mobile is full of energy and good humor, and Elvis treated the audience with a no "BS" show. The first performance we get to hear in full is the well know and worn 'Love Me', quickly and careless done, as usual by this time. 'If You Love Me' is the first "real" performance of the CD and Elvis delivers a good performance of this classic live number. 'Love Me Tender' is next and is done with a little more care than it would be done in the latter years. The same goes for the 50's medley, 'All Shook Up' and 'Teddy Bear/Don't Be Cruel'. 'Hound Dog' comes as a surprise, as Elvis puts a little more effort in the performance, resembling (just a little) his performance in the comeback special. A nice surprise. 'The Wonder Of You' is also a good performance, but it doesn't have the firmness of the early versions, like the 1970 versions that are much more strong and better vocally done. But it is a nice addition to any set list. Elvis shake things up with one of his best songs of all time, the rocking 'Burning Love'. Done with power it is a great performance, even if Elvis "scats" the final part. The band is cooking and so is Elvis. After the introductions with the familiar (but good) members solos, his most recent single and one of his finest songs, the tongue twister 'T-R-O-U-B-L-E' gets a rocking rendition. Unfortunately the tape is damaged in the middle of the song, therefore making it incomplete. Aloha From Hawaii's 'I'll Remember You' is another nice surprise. Elvis haves the tendency of joking and laugh his way thru the song, but not this time. He delivers a nice piece, straight to the end. The same cannot be said about 'Why My Lord? ', where Elvis cracks up JD Summer's solo in an insanely way. Some people may find it a bit boring to have Elvis "destroying" the seriousness of the song, but in reality is just Elvis having a good time on stage and pleasing the crowd, in a way that only he can do. The show picks up highly with an energetic 'Let Me Be There'. Always a perfect "live" song, Elvis is obviously enjoying singing it, as he repeats the end, much for the crowds delight. By now, Elvis was probably tired of 'American Trilogy' as we can clearly see that he doesn't pay too much attention to the song anymore. This, however, doesn't prevent it to be a good and enjoyable performance, complete with the powerful ending. It also seems that Elvis was attacked in stage by a more excited fan as you can hear a baffled noise as something was in Elvis mouth(!). He later asks about the girl that jumped on stage, saying that all she did was got a bunch of hair in his mouth. 'Funny How Time Slips Away' is charmingly done, with little joking. The funny 'Little Darling' would be the last song before the ending, if someone in the audience didn't have asked for 'Mystery Train'. Thanks for it; as it is a kicking performance and the band is also doing a great job. As usual, 'Can't Help Falling In Love' wraps up the evening in Alabama. Overall, another great show from the King. Not as strong as the shows in July or December that year, but very enjoyable all the way long. Good vocal performance, and extra effort put by Elvis in some oldies like 'Hound Dog' and the ballad 'I'll Remember You' makes this CD a cut above some other shows from the same tour, like the ones in Dallas and Houston. It is not as strong as the Show in Memphis that ended the tour, but if you're looking for a good show from this tour you can safely go to it. You wont regret it. © Sergio Luiz Fiça Biston, December 2004. Hot on the heels of my review of "Fly T-R-O-U-B-L-E", I have just listened to another Madison show. This one having taken place in the afternoon of June 2nd 1975 at the Municipal Auditorium, Mobile Alabama. Again it is missing the opening 2001 introduction, 'See See Rider' and 'I Got A Woman'. This time 'T-R-O-U-B-L-E' is also incomplete. Essentially this is the same show, but including 'I’ll Remember You' and 'American Trilogy', instead of 'How Great Thou Art' included on the former release. The packaging is extremely enticing in the form of a 12-page booklet with superb colour photos from the show, as we have come to expect from this label. No one does it better … but have they left any money in the budget for remastering the sound, after the disappointment of "Fly T-R-O-U-B-L-E"? Well, I’m relieved to report it’s slightly better overall. It is still very bright and hissy but at least the treble noise has been contained for the most part, although it is still prevalent during the group introductions and the songs that follow to a varying degree. Once again, Elvis’ mood is great, though there is not so much audience interaction as on the former show. At one point he enquires, "If the little girl who ran up here is OK, as all she did was get a bunch of hair in my mouth!" This incident can be heard during 'American Trilogy' after the line "old times are not forgotten". After the song, he asks for the house lights to be turned on and there is an extended kissing routine where the girls at the ringside can be heard clamouring for his attention. Performance wise, all songs are given the usual treatment for this tour. 'Burning Love' is committed, although he forgets one line of the lyrics. 'I’ll Remember You' is a nice version, although the hissing detracts. 'Let Me Be There' is sung enthusiastically with a reprise. 'American Trilogy' is slightly rushed and as a result lacks involvement but he does reach an impressive extended high note at the end. In my opinion the song receiving the most committed performance is 'Mystery Train/Tiger Man', performed as a request prior to his closing song. This is by far the stand out song for me on this show. However, there is one more surprise in store – for after the closing vamp we are treated to a bonus track from his March 21st performance at the Riverfront Coliseum, Cincinnati in 1976. This song stands out like an oasis in the desert after the sound quality of the former show, for it is very clear and has a good punchy sound, with the drums predominating. This concert has been issued before on the DAE label under the title "Holding Back The Years" but the sound is different here, as it is a binaural track featuring Elvis’s voice on the left channel (with most of the musicians) whilst the drums and organ are featured on the right. It is a standout recording, and makes me yearn for more recordings of this quality. Perhaps a taste of more to come?